Many parents understand the importance of having a pest-free home. However, they also know that several chemicals used to control various pests are dangerous for pets and children. SHS Pest Control understands parents’ concerns and values every family member’s health. This is why they offer an alternative form of pest control, which is the Integrated Pest Management (IPM) method. What is the IPM Method? The EPA encourages the use of this method because they say it is less harmful to the environment than standard pest control methods. IPM can be summed up as a holistic approach to pest management. The practice encourages education and awareness for homeowners. It also encourages preventative treatments in addition to control methods if infestations occur. The IPM method includes several components. The first part is pest monitoring. Homeowners must be vigilant and know how to look for signs of problematic infestations. Check out our web site for pictures of pests www.shspestcontrol.com. The second part of the program involves establishment of an action threshold, which is the point where enough pests are sighted that they should be considered a threat. Habit modification is the third part of the method. To successfully complete this step, homeowners may have to store food better, clean more often or take other steps to prevent pests from entering the home. The fourth step is using chemicals that are less harmful to eradicate pests. The final step involves regular inspections to confirm that precautions are working. If adjustments must be made to the plan, a specialist will provide helpful suggestions. 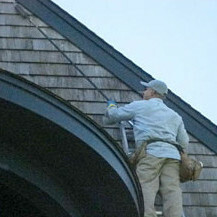 SHS Pest Control offers quality pest control in RI & Southeastern MA. Homeowners who want to protect their children and pets by choosing a greener pest control option may contact SHS for a consultation. We offer a wide variety of options to fit the needs of every family or individual. SHS’s pest control specialists know what it takes to eradicate and prevent pests, so call today to discuss ways to keep these unwanted dwellers away and for a free estimate for a protection plan that will protect your home and investment. Next: Take the Sting Out of the Carpenter Bee!